AV Connections, Inc. of North Carolina offers an extensive array of videography and video production services to help you retain the information from an important presentation or save an important family memory for generations to come. From corporate presentations and meetings, to weddings and graduations or commencements, our knowledgeable staff can help you create the results you are looking for with a business video or an entertaining and memorable personal video to help recapture a great event. 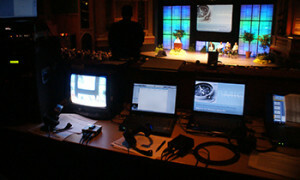 AV Connections of NC creates the finest quality professionally produced videos to bring it all back with efficiency and polish. We are pleased to offer these video production and videography services.